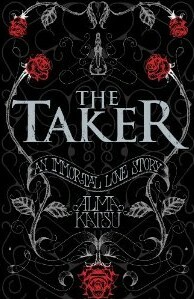 I am always a little hesitant about reading fantasy books but I did enjoy Twilight and so it was time to have a change from my comfortable chick lit and attempt The Taker by Alma Katsu. Have you ever loved someone so much that you'd do anything for them? When Dr Luke Findley turns up to his hospital shift in the small town of St Andrews, Maine, he's expecting just another evening of minor injuries and domestic disputes. But instead, Lanore McIlvrae walks into his life - and changes it forever. For Lanny is a woman with a past... Lanny McIlvrae is unlike anyone Luke has ever met. Hers is a story of love and betrayal that defies time and transcends mortality - and cannot end until Lanny's demons are finally put to rest. Her two hundred years on this earth have seen her seduced by both decadence and brutality - but through it all she has stayed true to the one true love of her life. Until now. Now most of you who follow this blog will know I always usually give my own version of the plot of a book but the above is the synopsis taken from the back of the book, so why have I done this? ( no I wasn’t being lazy!) It was reading this synopsis that had me eager to start this book as it sounded like nothing I have read before so I was looking forward to a fresh storyline that I had nothing to compare this book to, truth was I was intrigued just after reading the synopsis. This book doesn’t start you off gently we are took straight in to a shocking storyline when Dr Luke is at work and Lanny is brought in to be checked over as she is covered in blood and has just admitted to murder so as you can tell quite a quick start. Although Lanny has admitted to murder there is something about her character which intrigued me and for some reason I didn’t feel as if she was a cold blooded murderer. The beginning part of the book swaps between the current day and 1809 when Lanny was a child we get to see what she was like as a child and then as the book moves along and we see Lanny grow up there is a point in her life where she meets Adair the book then takes another turn and we get to see how Adair became the person he is. As you can tell there is a lot that happens in this book and there are lots of jumping from different characters and different decades but it all moves along so smoothly. Each of the characters are developed very well especially Lanny being our main character her story is told in first person narrative so we really get a first hand take of her thoughts and feelings all the way through her journey. This is a dark book and at times it made for hard reading through some pretty horrific chapters but having said that it still gave you the urge to keep reading to see what on earth happens next. This is far from a light hearted read that I am used to and yet I couldn’t put it down there was something going on in each chapter with twists and turns occurring under our noses. I think this is a fantastic debut novel for Alma Katsu I am looking forward to reading her sequel The Reckoning to see where she takes her characters next.